Is my (grand)child old enough to skateboard? I remember wondering this when my first grandson came home with skateboarding gear after visiting an uncle. To me, skateboarding seemed risky and dangerous. But as I watched him putting on his knee pads and helmet like a pro and say with a smile from ear to ear ‘Watch me Grandma!’ and sail down the driveway and sidewalk (they have a little steep to them) without falling and then to see him stop – spin around and look me still grinning and saying, ‘Pretty cool, huh?’ Well, of course I thought it was cool. I think he was 4 or 5 and I’m glad that uncle got him that skateboard, because I wouldn’t have and my grandson would have missed out on a lot of fun and exercise and outdoor activity. Today I came across an article on EzineArticles.com in which Denene Von Braun wrote . . . Kids get hurt learning how to ride a bike, a scooter, play ball – kids get bloody noses from learning how to catch softballs, I got one when I fell off a sled and I hit my head when I fell off a ladder climbing my way to the top of the big slide . I’m glad my own mother had a high threshold of pain or she would have never let me learn how to ride a bike, a scooter, attempt roller skating – oh yes, and then there’s the time I dropped a bowling ball on my big toe and lost my toenail, and fell off a horse and how many belly flops while learning how to dive? I’m looking forward to seeing this Skate Park come into fruition for the young people and families in Portage and the surrounding area. You might be too old, but your grandkids and kids aren’t! Donate to the Portage Family Skate Park today! Von Braun, Denene “Skateboarding for Beginners: How Old Should My Child Be?.” Skateboarding for Beginners: How Old Should My Child Be?. 12 Oct. 2010 EzineArticles.com. 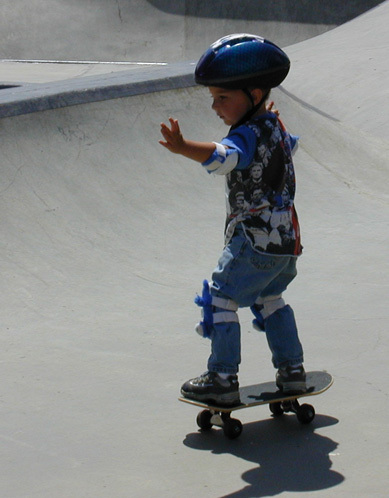 10 Feb. 2014 <http://ezinearticles.com/?Skateboarding-­for-­Beginners:-­How-­Old-­Should-­My-­Child-­Be?&id=5193087>.